ABOVE GIG HARBOR - Fabulous Mountain, Harbor, Sound View!!! make your stay comfortable, easy and worthy of your time and trust. Come once and you will certainly return (and with a $25-$50-$200 credit for your 2nd stay.) Specialty lighting, art glass, plantation shutters and open, high-beamed, heavy-timbered ceilings throughout. There are ceiling fans in every room. (A Master gardener and an interior decorator have each lived here in the past.) Extensive lawns and gardens (gardener and owner maintained) on this acre property at the crest of Peacock Hill overlooking everything! Play croquet, badminton, barbeque, sit and enjoy the view, read, cook, pick flowers (lots of vases available), eat, workout using the on-site exercise equipment, sleep, party. Herb, salad, berry and border flower gardens, Privacy created by mature flowering trees and bushes. This is a Play Space! Large foyer with fireplace steps down between copper railings to open living-dining area, french doors to old-brick terrace, greenhouse wall and bar to gourmet kitchen. Walk-in, fully stocked pantry: Cuisinart, blender, Hitachi rice cooker/steamer, crock pot, G.F. grill, Panini grill, fondue, Belgian waffle maker, Salton food warmer, toaster, Nutone food center + all attachments, 3 coffee makers, picnic gear, wine rack, paper goods, food staples and treats provided. 4 sets of dishes, stemware assortment, cookware, variety of table linens, entertainment tableware, OR, with advance notice owner can arrange for fantastic catering: a simple meal, or an elaborate party. Up the ship ladder stairway is the small, 2-room loft that sleeps 2-3; full bed in one room (view), twin in second room. Powder room at foot of stairs, down hall to 900sf bedroom suite: Cherry-paneled library/entertainment room with fireplace, American Leather full-depth, firm, king mattress, game table, TV/music; shuttered, double doors to huge bath with walk-in cedar dressing room, then more double doors to 500sf two-level bedroom with writing desk area, sitting area, new pillow-top, firm, queen bed, cedar linen closet and another walk-in cedar closet, carpeted half flight of stairs to 'basement' with large laundry room, hang-out game area (puzzles, games, electronic darts, checkerboard game table, rug, lounge chair, exercise/workout area. Back upstairs in the bedroom, french doors to covered hot tub deck, steps to lawn, terrace...all with great views: Puget Sound, Mt. Rainier, Gig Harbor, town, harbor, Crescent Valley, ridge line, pasture. City & boat lights at night rival the daytime scenes. Call owner for further information and to answer all your questions. *Please note: stays of 30 nights or longer will not incur state hotel tax and will be removed from your total quote shown. I truly enjoy being a concierge-style owner...meeting and greeting guests and making their stay here successful. Faculty at a small college in Tacoma, I, too, love to travel, sail alot (weekly crew a J-109), ski, knit and quilt, and in the few moments remaining, try to occasionally bike, hike, weave and spin. Come stay here and you'll see why! I actually live just 4 miles away, but still enjoy time at 'Above Gig Harbor' for all the reasons described in the listing....primarily the hot tub, barbeque, workout room, the view, the gardens...and it's a great place to have a party. 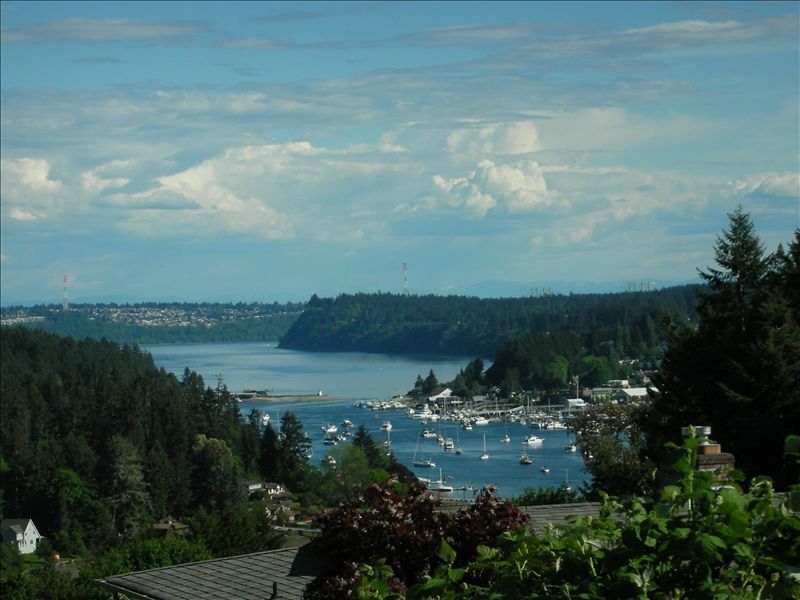 You can actually see the fishing village town of Gig Harbor from the property and walk it as well. Puget Sound actually being part of the ocean you're just a walk down the hill from it! Charming and historic downtown Gig Harbor at the foot of the hill and visible from the house! Cosidering Puget Sound as part of the Pacific, there's a fabulous view of it! Quiet, comfortable, programmable gas heat. Space heaters and fans also provided. New/high quality bed and table linens and bath, hot tub and kitchen towels. Carpal port just outside front door. Basement fitness area and equipment. See photos... A lovely place to sit and visit. Library provides a second comfortable gathering place. Several… Drip coffee maker, espresso maker, French presses, coffee bean grinder. Large pub-height table with 6 upholstered chairs plus 4 additional upholstered stools. Table has butterfly extension for more area. NEW 42' flat-panel, plasma HD-TV! + DirecTV with premium movie channels - wireless internet connection! Novels, travel, PNW books + current magazines provided include: Vanity Fair, Coastal Living, National Geographic, Fuures, Forbes, House Beautiful, Architectural Digest, Elle, Elle Decor, CS Monitor. Complete gameroom In basement plus workout area, 3 bicycles and a scooter. Full game room table in the basement game room plus workout area. Library has poker chips, cards, chess, other grown-up games. Huge lawn plus border gardens plus potted annuals plus Herb Garden plus salad garden. For rent at the foot of the hill. All kinds of boats are available to rent at the foot of the hill in the harbor. Beautiful, free court available at the Gig Harbor city park less than a mile away down the hill. Lawn furniture/firepit/outdoor living; 2 fireplaces; entertainment room/library; gourmet kitchen and full range of prep appliances; stocked walk-in pantry; empty closets and drawers, except for items for you to use (iron/ironing board/clothes steamer/hangers, basic cosmetic supplies (toothbrushes/hair dryer/cotton balls/lotions/tissues/soaps/extra towels/laundry supplies,etc. ); notebook with brochures/info/coupons on many things to do in the area; 3 bicycles/work-out room + game room in basement; catering and other concierge services available. Owner/manager welcomes your suggestions for additional amenities. Nicely appointed and comfortable home with multiple outdoor living areas. Well stocked pantry with a number of coffee makers including French press as well as condiments and canned goods. House comes with board games, workout equipment and bicycles. Situated close to Gig Harbor's shopping, restaurants and bars as well as just a short drive to the interstate. Black tail deer will be munching on wild blackberries just a few feet away as you enjoy a cocktail in the hot tub at sunset. We had a wonderful time at this home, it was quite and the view was very calming as we were preparing for our daughters wedding and had lots of room for our family. Pat was awesome and easy to work with from the start to the finish of our stay. I would recommend this to anyone that wants to feel like they are at home. I am in the hospitality business and this was one of my best experiences. We will always rent a home instead of hotel rooms when we have a family gathering. Gig Harbor is beautiful and everything you need is very close. Thank you Pat for a wonderful stay in a beautiful home. We rented this vacation home for the Oct. 8th Parents' Weekend at UPS. Pat met us at the house and walked us through all the wonderful amenities. The house is fully stocked and the linens were very cozy! We hosted a BBQ for our son and his friends along with their families. The house is perfectly set up for a large gathering. Costco and Albertsons are close by in an upscale shopping area near the home. The highlight of the stay was the hot tub on the patio with a view of the harbor. We highly recommend this vacation property and look forward to future visits. I found this property through a search of vacation homes in the Gig Harbor area to house a group of co-workers for a working weekend. In the past, we had stayed at a local hotel which proved expensive and did nothing for the casual evening banter that we enjoy after working as instructors a local fire department training event. Pat, the owner, was available throughout the weekend to answer any questions about the property and the house was absolutely perfect. Plenty of parking for our group of six and plenty of sleeping options for all. The living room, back deck area, and kitchen was the perfect gathering spot and there was more than enough seating even for additional visitors. Thank you Pat, we will be back again next year. and a plethora of cooking utensils. questions about the house or the surrounding area. Great place to enjoy Gig Harbor! Our family greatly enjoyed this vacation home. The kids loved the hot tub, the games provided, and the cool ladder up to their loft. The owner was very helpful. The view of the water from the back yard is beautiful. This house is unique and truly a home, not a sterile hotel room. With Costco, target and Albertson's within 10 minutes, it was easy to make meals here. There are lots of one and two step levels in the home, so would not be an easy place for a crawling baby or unsteady toddler, but our youngest was 5 and she loved it. We would definitely recommend this home! Walk down the hill to 4 fine, waterfront, restaurants/artisan shops; bus, drive or bike to town center 2 miles; (3 nice bikes and a scooter for you to use); great knitting, quilting, art, ice cream!, and apparel shops; 1 mile to world-class YMCA pools/fitness complex, Target, Albertson's, Costco, Home Depot, etc. + 25 min. to Seattle ferry; bus stop at edge of 1 acre property - ride to Tacoma or Seattle or to train to Seattle and north or Portland and south. With advance notice, owner will arrange for bicycle, kayaks, books of your choice on site, catering, activity suggestions. Library/entertainment room always has selection of books, current magazines, basket of knitting books, needles and an assortment of yarns for you; basic workout gear set up in basement; carpeted hang-out, game room also in basement. Do you sail? Owner may be able to arrange for you to crew in a weekly race on Puget Sound. And everyone walks Gig Harbor,,,sidewalks all the way around to the mouth of the Harbor. There are substantial discounts for longer stays. For instance: 1 week booking = one night FREE (stay 7/pay for 6) 2 week booking = three nights FREE (stay 14/pay for 11) 3 week booking = 6 nights FREE (stay 21/pay for 15) 1 month booking = 10 nights free (stay 31/pay for 21) Stays of 30 days or longer avoid the 10.5% Washington State hotel tax, which is charged on the rental and cleaning fee.